The oldest public university in Idaho is the University of Idaho, located in Moscow, Latah County. There are many public, private, and community colleges in Idaho. The first university in the state, University of Idaho, Moscow, was founded in 1889. The latest school to achieve the status of university is the Boise State University. University of Idaho (UI) has the state's largest campus, located in Moscow, Latah County, Idaho. It is the state's oldest public university. This state flagship university was founded on January 30, 1889. For 71 years it was the only university in the state. The annual enrollment of students on the Moscow campus is approximately 11,000 students. The university offers various bachelor's, master's and doctoral courses in 142 degree programs. It is spread across 1585 acres of land and has branch campuses in Coeur d'Alene, Idaho Falls, and Twin Falls. Lewis-Clark State College is located in Lewiston, Idaho. This public undergraduate college was established in 1893 and enrolls approximately 3,500 students annually. Before becoming a state college, it was a community college and was known as Lewis-Clark Community College. It is popular for its courses in Criminal Justice, Education, Nursing, and Technical programs. The college offers more than 83 degrees in various disciplines. Boise State University is located in Boise, Idaho. It is a public university that was originally founded by the Episcopal Church. Founded in 1932 as Boise Junior College, it became an independent institution in 1934. The university enrolls approximately 20,000 students and offers more than 200 degrees in 190 areas of study. Since 1965, it has started awarding master and baccalaureate degrees. The main campus covers an area of 175 acres of land and is at an elevation of 2,700 feet. The university has other educational centers in Nampa, Mountain Home Air Force Base, Gowen Field, and Twin Falls. 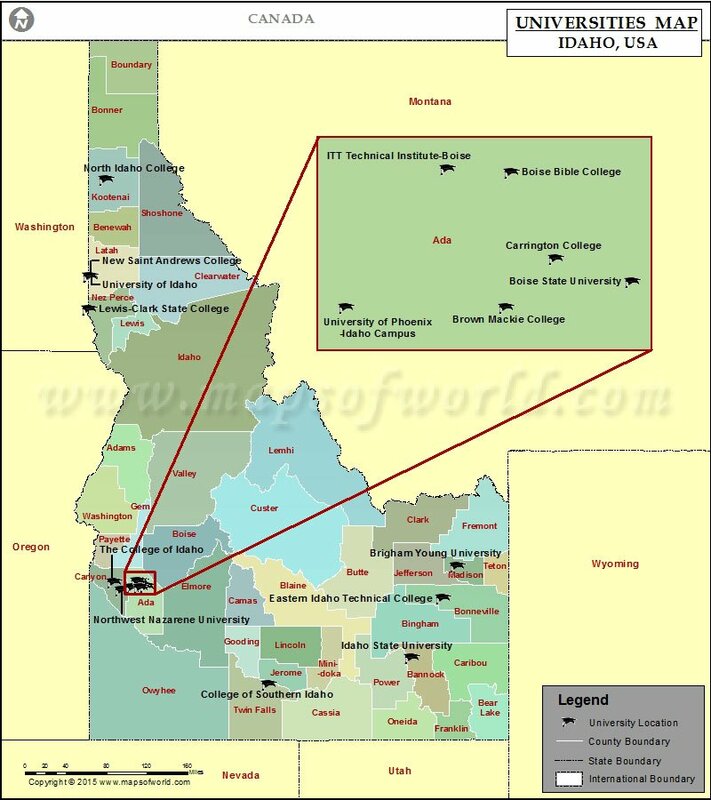 College of Idaho is located in Caldwell, Idaho. Established in 1891 by Dr. Rev. William Judson, it is a liberal arts college and enrolls approximately 1000 students. The college offers around 100 programs in majors, minors and collaborative programs.